But then…..ya have two peeps like in this pic. 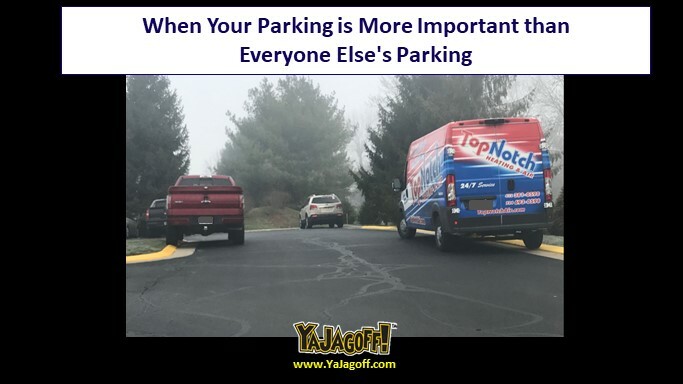 The TopNotch (But Not at Parking) van and the Red Solo Truck (you’re welcome for the ear-worm) just had to be closer to their destination than all of the other people who wanted to park close! On top of that, they thought it might be wise to grab a little “curb appeal” thusly narrowing the driving path for everyone else! Hey boys, good to know that your parallel parking skills are up to par! But, those parking spots seem a little selfish don’t ya think? No better way to teach your young hockey players to be humble than to say, “Hmm…no more spaces close to the rink so I think I’ll just go wherever the hell I want!” I mean, for GAWDSAKES… royalty like you tow shouldn’t EVER have to lower themselves by parking in a simple commoner’s spot in an adjacent lot just 25 yards away! Right? Ya Jagoffs!